The scheme was piloted in 19 local authority areas. The government's waste advisers are claiming success for a pilot project in which households had their food waste collected separately and composted. 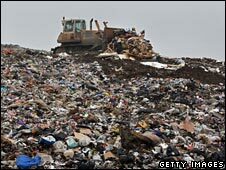 They say 4,272 tonnes of food waste were diverted from landfill, preventing the release of 1,967 tonnes of CO2. Nineteen English local authorities experimented with ways of collecting food waste from 94,000 households. In the majority of areas, more than 70% of people agreed to separate their food waste for composting. The average food waste collection was between 0.3kg and 2.2kg. There have been widespread reports of dissatisfaction from households around the country as councils have begun the great shift away from traditional weekly bin collections. But the advisers, known as WRAP, say the response to the food waste trial is encouraging. They had thought people might refuse the extra work involved in separating the waste or object to the smell of the special bins, but they said most people participating reported high levels of satisfaction with the service. WRAP hopes the government will extend the scheme. Phillip Ward, director for local government services at WRAP, said: "We throw away 6.7m tonnes of food every year in the UK - £10bn worth - and most of that goes to landfill. "We are delighted by the results of these trials, which show that if consumers are given the right tools and are provided with a good service, they will participate in initiatives to cut waste sent to landfill." Mr Ward added that several authorities involved in the trials had decided to roll out food waste collections to more households. The organisers believe that a survey of people in the pilot areas identified a gap between perception and reality. Of the non-participants interviewed, a common reason for not taking part was that residents felt that they did not produce enough food waste to make it worthwhile. However, WRAP research in the recent "The Food We Waste" report shows that even households claiming that they generate no food waste at all produce, on average, 2.9kg per week. Concerns about potential odour, hygiene issues or attracting vermin were the reasons given by 24% of non-participants - but for those who did participate, the majority claimed not to have had a problem with any of these issues.